Ceiling hooks provide a convenient location to hang a variety of household items such as plants, kitchen pans or racks. If the ceiling hook will support heavy weight, it is critical you properly install it to prevent the hook from pulling out of the ceiling. The key to ensuring a sturdy installation is to locate the ceiling joist and ensure the hook is centered in it. 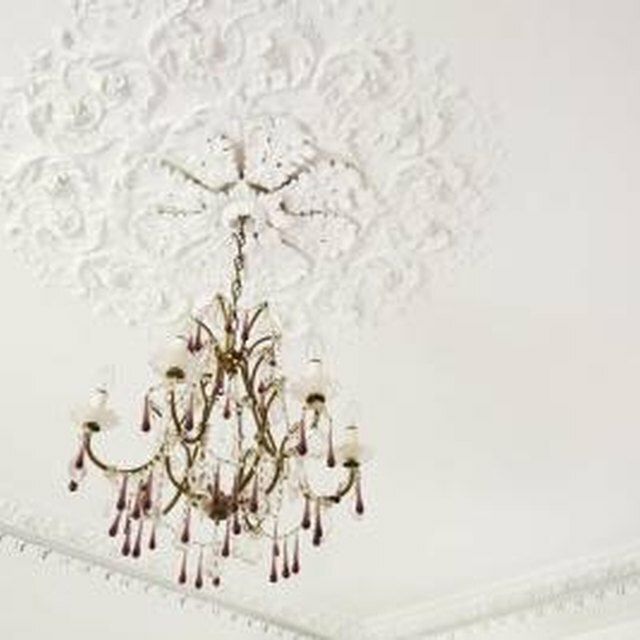 Place a ladder or a step stool underneath the ceiling area where you want to install the ceiling hook. Climb up until you can reach the ceiling and use a stud finder. Place the device flat on the ceiling and slide it until the location of a ceiling joist is indicated. Mark the location with a pencil. Continue sliding the stud finder to the left or the right. When you locate another joist, draw another mark on the ceiling; this is the end of the joist. Don safety glasses and insert a 1/4-inch bit into a drill. Place the tip of the bit on the ceiling between the two marks. Squeeze the drill trigger to create a 1-inch-deep hole in the ceiling. Insert the threaded end of a hook, which resembles a screw, into the hole and turn it clockwise to insert the threads into the hole in the ceiling joist. Once you can no longer hand-tighten it, twist it another half turn using pliers. Hang the desired object on the bottom of the hook.